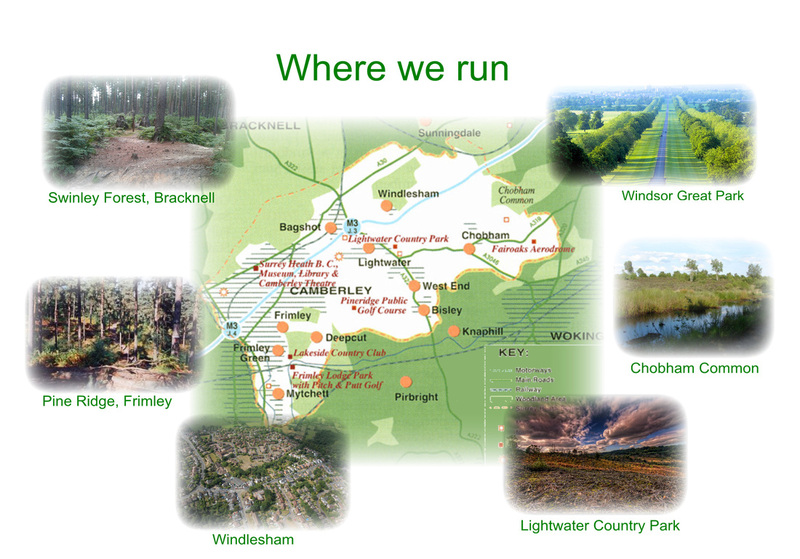 Windle Valley Runners is a running club in the Surrey Heath area. We were formed in 1989 by a group of local runners, and were naturally centred on Windlesham. Over the years we have attracted members from a wider area, so that nowadays our locality covers the area that includes Chobham, Bagshot, Lightwater, Frimley, Camberley, Sunningdale and Ascot, and some members come from the wider surrounding area. We are a road and trail running club, rather than track and field athletics. We have regular group running and training sessions every week, and are part of the Thames Valley Cross Country League which takes place in winter. ​If you are looking for a club where you can run for fun and fitness, come and join us. If you want to also take it seriously and take on some races, we're good for that too. Just as importantly, we have many members with us who don't compete in racing, but are with us for the enjoyment of recreational running with a group. We have a membership of over 200 people, ranging in age from 18 to 70+, and with running speeds from 6 minutes per mile to 12 minutes per mile. Some members race a lot whilst others just run for pleasure. Our club running programme is designed to be interesting and fun, and to cater for all needs. It includes social runs, interval training, time trials, and a regular 10K handicap race. We have several UK Athletics-qualified coaches who lead and participate in our training sessions. We are members of the winter Thames Valley Cross-Country League, which has 15 competing teams. There are eight league races each winter season, in a variety of picturesque and challenging venues. We encourage all our members to take part in this - the races are hugely enjoyable events, and great social occasions too. In the 2017-18 season, we finished as league champions for the first time ever. Club runs take place on three days each week and at a variety of venues around our patch. Why not attend one of our runs and introduce yourself. Our current training venues and times are shown on our diary page.